Only a few years ago, our industry responded to global needs to conserve energy by improving the efficiency performance of heating and cooling equipment. So, if you have a central furnace, air conditioner or heat pump system with equipment manufactured before the 1992 Department of Energy (DOE) established new efficiency standards, there’s a good chance your heating and cooling fuel bills are 20-40% higher than they need to be. Today the Environmental Protection Agency (EPA) promotes high efficiency products through its Energy Star Program. 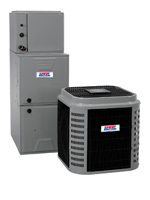 All Heil furnaces, air conditioners and heat pumps currently meet or exceed DOE minimum efficiency standards. In fact, Heil has a complete lineup of ultra-high efficiency products that exceed the minimum efficiency standards of the EPA’s Energy Star Program. Heil has a number of ultra-high efficiency products* offering some of the highest efficiencies available today! 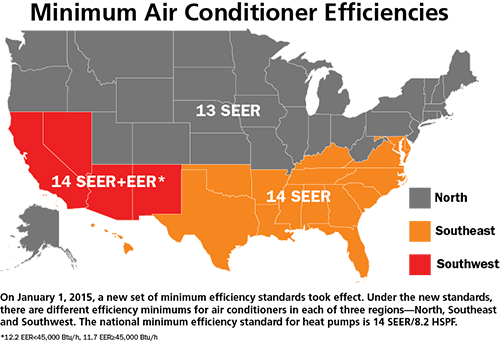 In January 2015, the US Department of Energy enacted new minimum efficiency rating guidelines for split and packaged air conditioners which are defined by three regions of the country: North, Southeast and Southwest. Please reference the map and chart below, or talk to your local Heil® dealer. The DOE set up a system to measure central heating and air conditioning efficiency performance. Today, you can easily use this information to help you in your system selection. Your actual savings will depend on the weather in your area, utility costs, your home’s energy efficiency, and your preferences for indoor temperatures. 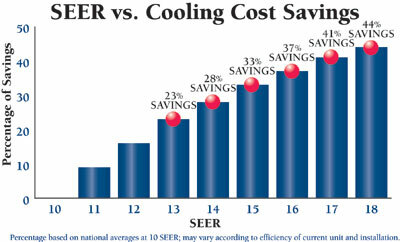 However, generally, in areas with hot temperatures or above-average electric costs, you can benefit from a higher-SEER cooling unit. Likewise in areas with colder temperatures or above-average fuel costs, you’ll usually benefit from a higher-AFUE gas furnace. In practical terms, you can compare annual operating costs of two cooling systems just by knowing their efficiency ratings. The DOE and the EPA initiated the Energy Star Program to promote use of energy-efficient products. International Comfort Products, LLC (USA), the manufacturer of Heil products, is a voluntary partner in the Energy Star Program. Gas furnaces use Annual Fuel Utilization Efficiency (AFUE) as their measurement. 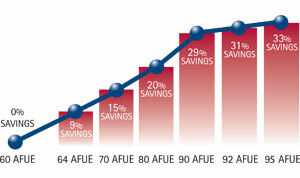 The higher the AFUE, the greater the efficiency and the greater your energy savings potential. Because some of the heating potential of fuels is lost during furnace operation, no furnace is considered 100% energy-efficient. The AFUE tells you the amount of fuel burned that actually goes toward heating your home on an annual basis. Prior to the 1992 federal regulations, most gas furnaces were built with standard efficiencies ranging from 60% to 78% AFUE. These are the furnaces that are being replaced today. For example, if you have one of these older furnaces with an efficiency of 65%, then out of every dollar you spend on fuel, $0.35 goes up the chimney! If you replace it with a new Heil 90%+ AFUE furnace, then, of every dollar spent on fuel, less than $0.10 goes up the chimney—a 40% increase in savings! Your installing dealer follows our published recommendations for matching the various components required. For example, split system air conditioners include a condensing unit that’s located outside your house and an evaporator coil that’s located inside your house with your furnace or air handler. Your dealer must take special care to match the condensing unit selected to its corresponding evaporator coil. For any split system air conditioner to deliver its rated efficiency and performance, both the outside condensing unit and the indoor cooling coil must be matched. For example, if you have a new condensing unit put in, but don’t have the indoor coil updated, you won’t get the maximum cooling energy efficiency.